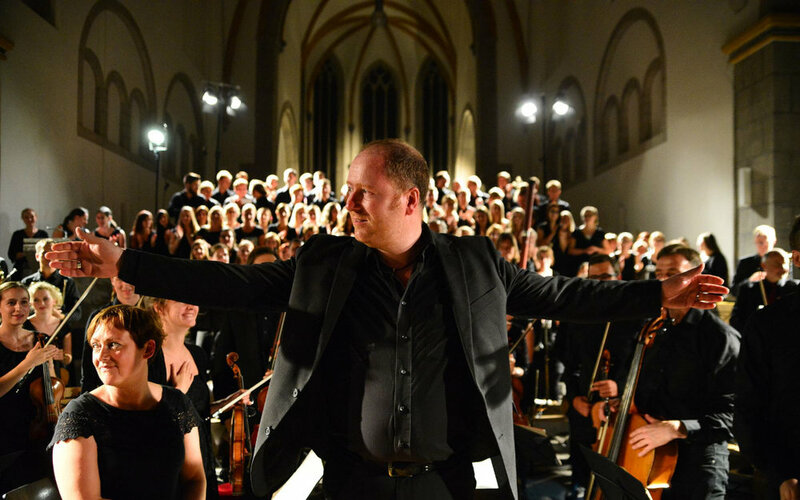 Deeply rooted in the musical tradition of his home town, Ron-Dirk Entleutner, former member and prefect of the St. Thomas Boys Choir, is regarded as one of the most interesting and influential conductors in Leipzig. During his studies at the musical conservatory "Felix Mendelssohn Bartholdi" in Leipzig, he founded the ensemble "amici musicae", choir and orchestra, with which he has performed successfully in Germany and abroad to this day. His musical work is influenced by two emphases, the works of Johann Sebastian Bach and rarely performed choral symphonic music. Since 2000, he has directed the Youth Symphonic Orchestra Leipzig (Das Jugendsinfonieorchester), several times federal prizewinner, with great success at the Johann Sebastian Bach Music School of Leipzig (Musik Schule Leipzig Johann Sebastian Bach). Ron-Dirk Entleutner has focused his attention particularly on training and promoting young musicians. He was appointed as musical director at Koblenz University in 2007 and as director of the National Youth Choir of Saxony in 2015.